My very first post on White as Milk is up. I blog about twins. It’s really quite fun for me to be blogging in 2 different places and I hope I’ll see you there as well. 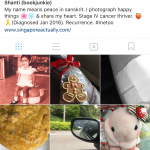 This entry was posted in White as Milk and tagged cute, fraternal, funny, identical, Singapore, thoughts, twins, Video. Bookmark the permalink.